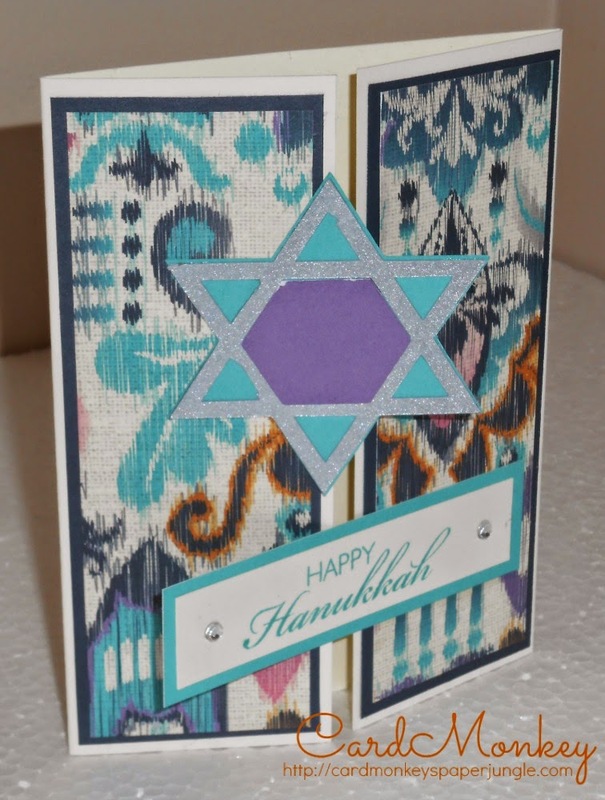 CardMonkey's Paper Jungle: Last day of four -- Hanukkah cards galore! Hanukkah continues, and so I will show you the last of my 12 cards I made for friends and neighbors celebrating this special holiday. If you missed Cards 1-9, please scroll down. If you are following along, you'll recognize the CTMH Sarita paper used here, from the Spinner Card I showed you yesterday. This time, I made a gatefold card -- it opens in the center -- that is held shut with a Star of David at the top, and a sentiment at the bottom. I cut the Star of David using my Silhouette Cameo, a Design Studio file, and matte silver stock by Bazzill, available at Scrapbook.com. I backed the cut silver star with CTMH's Lagoon cardstock, and a center piece cut from Gypsy cardstock. 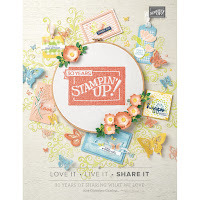 The sentiment is from Simon Says Stamp, stamped in Lagoon Exclusive Ink from CTMH, on a Colonial White piece of CTMH cardstock that has been lined with Lagoon cardstock. I LOVE that CTMH sells papers and inks to match exactly! I put two sparkly bits on either side of the sentiment, and it's done! I found this beautiful dove in the Cricut Design Space files and so cut (using my Cricut Explore) "him" out using Crystal Blue cardstock from CTMH. 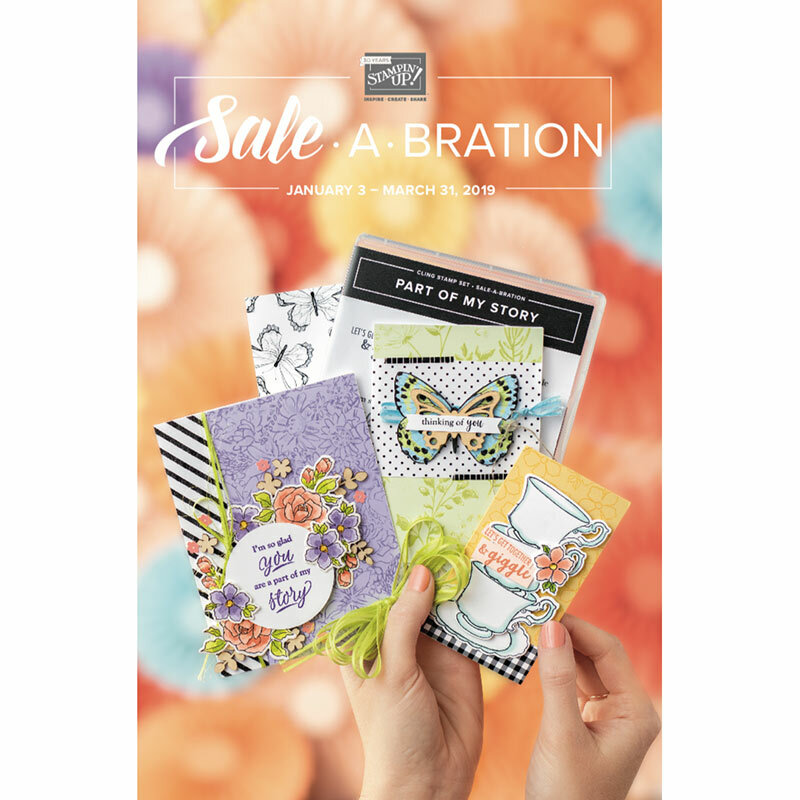 While that was cutting, I found the swirled word "Peace" in a Silhouette Design Studio file, and cut that out using my Cameo, using White Daisy CTMH cardstock. You can never have enough metallic gold in my world, so this lovely paper from Bazzill is a staple in my craft room. I cut the Stars of David out using my Silhouette Cameo and one of Silhouette's files. Once everything was cut, I grouped all of the cut pieces on a backing of Outdoor Denim blue cardstock. I toyed around with some border scribbles, using a Sakura white gel pen. I like the casual feel to the scribbles, though I think I'd lighten up a bit on the pen when making this again. I added three Sparkle Gems from CTMH in the lower right hand corner to call this complete! 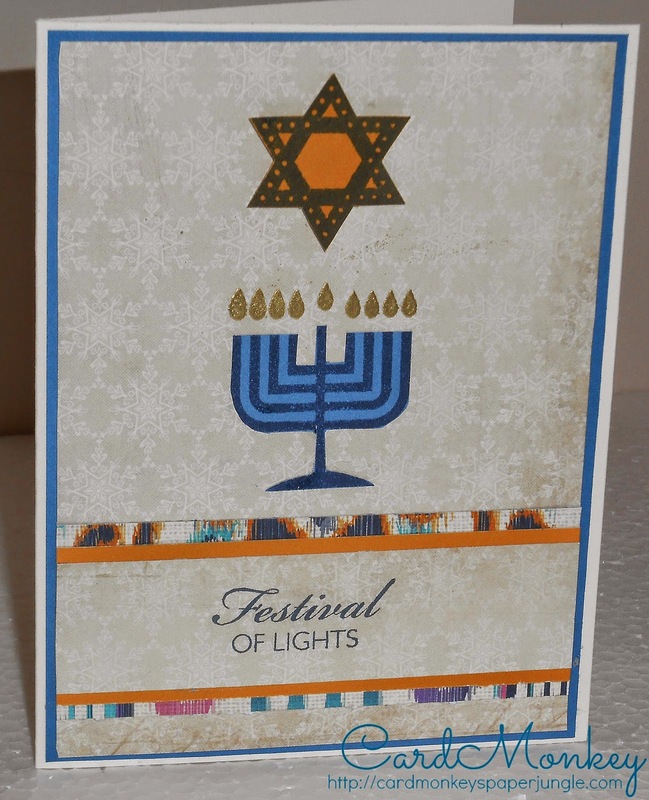 Pretty "Frosted" paper from CTMH (now retired) was used for the backdrop of a tableau for a fussy-cut menorah that had been stamped in Pacifica ink onto Lagoon paper by CTMH. The flames, stamped separately in a stamp set by CTMH, were gold embossed. 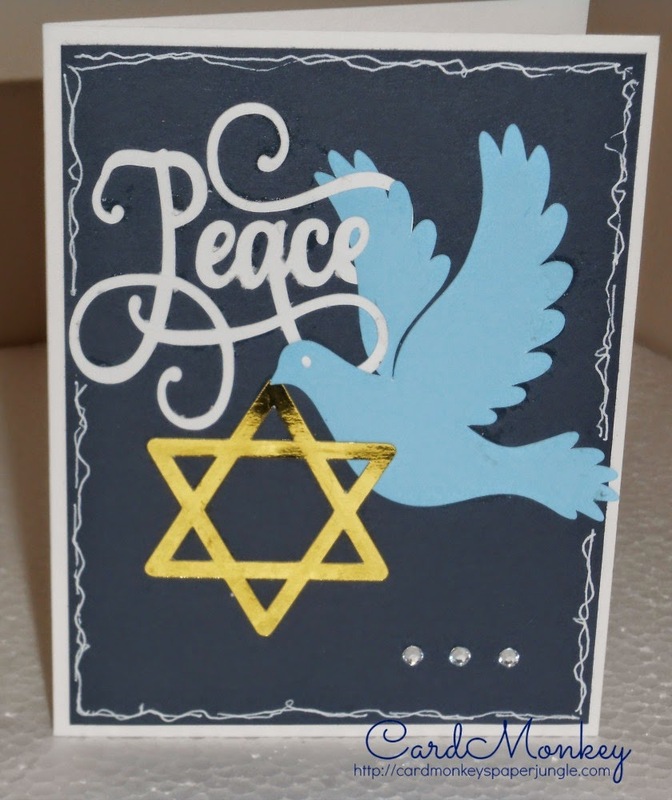 The Star of David is from a Papertrey Ink stamp set, stamped in Outdoor Denim ink (CTMH) onto Goldrush cardstock (CTMH) and fussy cut, and raised with pop-dots. The sentiment is from a CTMH stamp set, stamped in Outdoor Denim ink, onto Frosted paper that has been layered with a bit of Goldrush and Sarita papers by CTMH. For a pop of color, I added a lower layer of Lagoon paper peeking out behind the Frosted paper. I hope you have enjoyed these Hanukkah cards. Season's Greetings to you and yours! Thank you so much for sharing---all are beautiful!